I say “nuanced” because after a month or two of learning movement planes and how to balance loads using proper technique, a phase best done with fairly light weights, forks in your training road begin to develop that depend first and foremost on your training goals. Let’s see how. What’s the Right Load? It Depends. You could put the 45s on each side and do just 1 or 2. 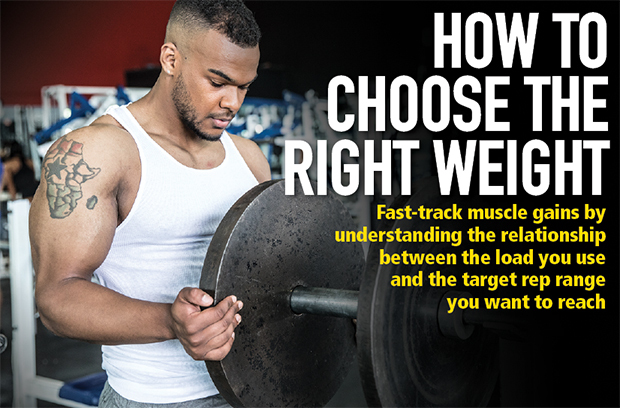 Any of these options works, and with each one you could push to muscle failure (that is, the point in which you can’t do another rep on your own with good form). Each of them is very hard, at least on the last rep. But which one is best? To answer that, let’s first consider your training goals. The load you choose to get as strongas possible will be a heavier one than what you’d want to build as much muscleas possible. And if your goal is to optimize muscle endurance, you’ll be using an even lighter weight for higher rep targets, but that approach limits muscle and strength gains. If you’re training to maximize strength, choose a weight that you can do for just 1 to 6 reps.
For maximizing muscle growth (called hypertrophy), choose a weight with which you can do just 6 to 12 reps.
And when focusing on muscular endurance (your ability to go longer periods without fatiguing), the load should be one you can do for at least 15 reps. Note that these three training goals use distinct rep targets, which, working backward, helps you determine the appropriate load. If you choose the wrong weight for your goal, you’ll still get some benefit, but it won’t be optimized. That is, training for muscle size, using a moderately heavy load, also provides a strong stimulus for strength but not an optimal one. No wonder bodybuilders are strong—but not as strong as powerlifters. Here’s a summary of the three training protocols and how each differs. Strength trainers push very heavy loads for just a few reps, or as few as just one. Powerlifters and other strongmen lift heavy in practice so they can lift heavy in competition. Their workouts consist primarily of multi-joint exercises such as bench presses, rows, squats, and deadlifts. Multi-joint exercises are characterized by two or more sets of joints working in tandem, such as the hip, knee, and ankle joints when squatting. It’s the attached muscles that pull on the joints to cause movement. More total muscle mass involved in completing a movement allows you to lift heavier weights, and that in turn is a signal for greater natural anabolic hormone release. Heavy weights selectively recruit the fast-twitch muscle fibres into action, which are the ones more prone to growing bigger and stronger in response to the stimulus. These fibres fatigue quickly, however, which is why you can’t lift a very heavy weight many times. When training for strength, your focus isn’t on individual body parts, as a bodybuilder would train, but rather, on the main lifts and the assistance exercises that help you improve the main lift. Because the intensity is high (intensity is defined here by the weight you use divided by your single-rep max, expressed as a percentage), while total volume (that is, the number of sets multiplied by the weight) is low. Rest periods between sets for the main lifts are intentionally fairly long (three to five minutes) to allow for greater recovery, of both the muscle and also the central nervous system. Strength trainers also don’t go to muscle failure, a technique favoured by bodybuilders. When you lift to optimize strength, you do in fact get bigger, but the methods won’t maximally increase muscle size. Instead, you’ll want to use a slightly different approach, one that requires you to choose a weight that you can lift for 6 to 12 reps. That is, if you can do only 4 reps, the weight’s too heavy and you must reduce it on your next set; conversely, if you can do more than about 12, it’s too light and you need to add more. What’s more, cheat reps don’t count toward the total.If you have to throw your back into a biceps curl or bounce the bar off your chest when benching, that’s getting help from other muscle groups or using momentum (we call that cheating). There are all sorts of ways to cheat, which can be robbing you of muscle growth if used incorrectly. That’s why you should learn how to do each movement properly and practice them over and over again until they become second nature. Ultimately, for maximizing muscle size, it’s all about choosing the load that enables you to barely complete 6 to 12 reps with good form. Once you can do more reps than that (not by cheating), you can increase the load. This type of training also primarily targets fast-twitch muscle fibres, but that’s where the similarities with strength training end. Workouts are separated by target muscle groups, and secondary exercises are chosen to work the body part from different angles that maximize overall muscle size. The intensity is clearly lower (you’re using a lower working poundage compared to your 1RM) than the strength trainer’s, which allows for a higher volume (more total sets). Rest times are typically shortened to 60 to 90 seconds between sets as it’s advantageous to carry over some degree of fatigue from one set to the next. Not everyone wants to get as big or as strong as possible. Some individuals train to allow their muscles to function for longer periods of time, such as marathon runners. Here, using a lower intensity (relatively light weight compared to your 1RM) targets the slow-twitch muscle fibres’ ability to become more aerobically efficient by boosting the number of mitochondria within the cell and number of blood capillaries, but notits size or strength. Here, an individual can perform work for longer periods of time without becoming fatigued. The lower intensity exercise also uses different energy pathways, which speaks to the nature of aerobic versus anaerobic work. In the gym, focusing on muscle endurance means choosing fairly light weights that can be done for 15 to 20 reps, or more. The training stimulus builds only nominal amounts of muscle and strength, given the fast-twitch fibres aren’t being targeted.